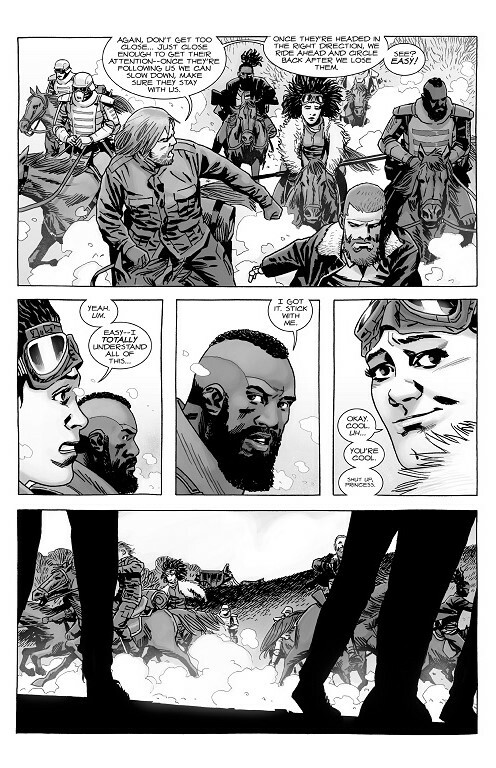 A Look at The Walking Dead #181- “Together Strong” | What Else is on Now? 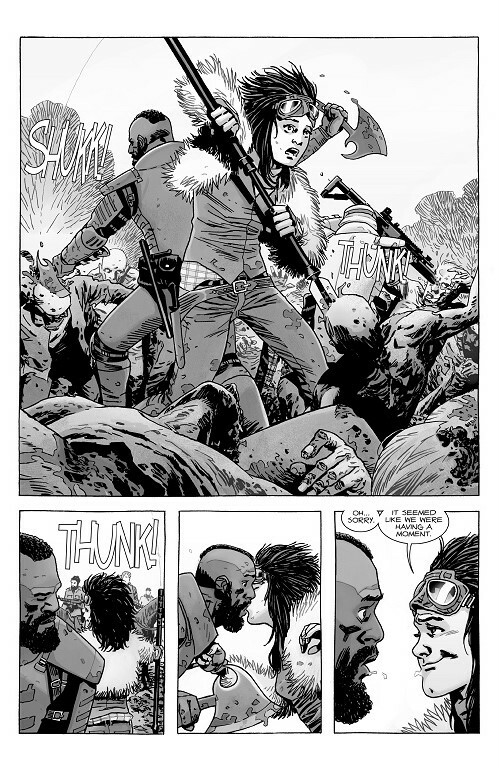 So we ended on somewhat of a cliffhanger note last time, with Rick and Pamela at odds on how the world should be run. Or rather, at odds on the need for a world order. So one would think that the follow-up is a continuation of that conversation. Nope. Instead, Rick treats Pamela to a grand, sweeping view of the Oceanside community. 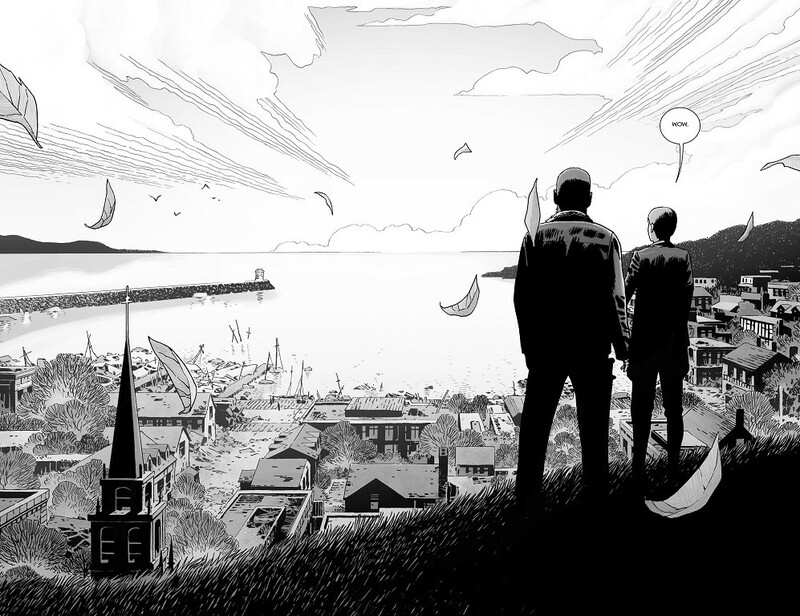 And unless I’m mistaken, this might be the fullest view of Oceanside that we’ve gotten in the comic. I might be wrong, but I feel like, compared to other communities, we’ve gotten glimpses of Oceanside and the people in it, but haven’t spent a ton of time there. 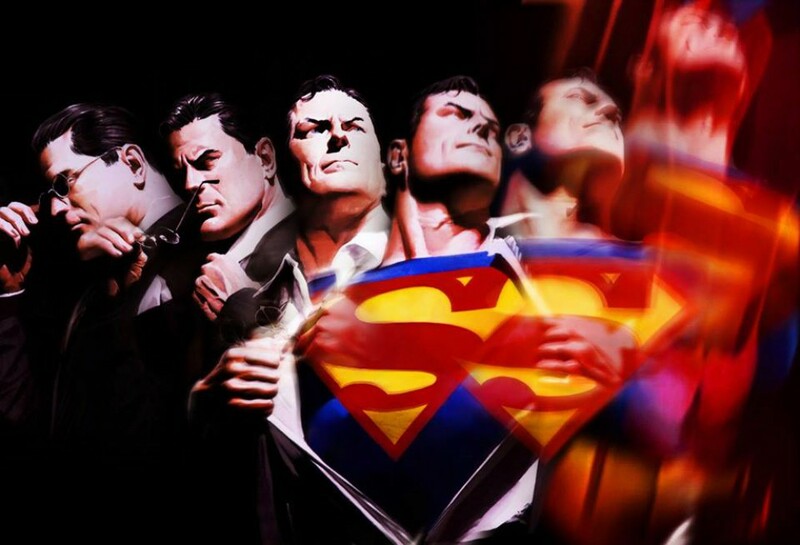 But it is a nice way to diffuse the tension and the panel itself is great with some nice artwork. And I’m guessing this is a long walk or journey around the area that Rick and Pamela are on- that or Oceanside is closer to the Alexandria Safe Zone than I thought. We briefly jump over to the Commonwealth and learn that Michonne has taken up the lawyer position that Lance spoke of earlier. Good for her. Granted, as she tells Elodie, it’s been quite some time since she practiced law, so she’s no doubt rusty, so it could take her some time to get back into the swing of things. 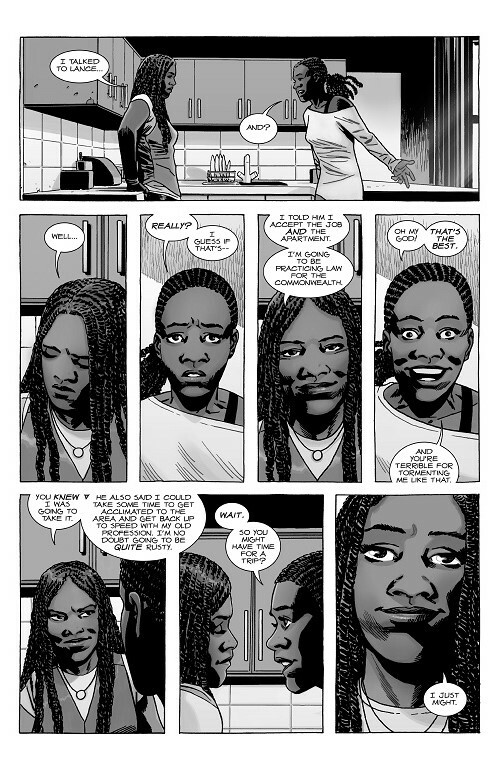 However, Michonne also says that since it will take some time to used to her new surroundings, she can take some time, possibly for a trip. And if the cover of an upcoming issue is any indication, things could get pretty nasty very soon. But we’ll get to that when we get to that. 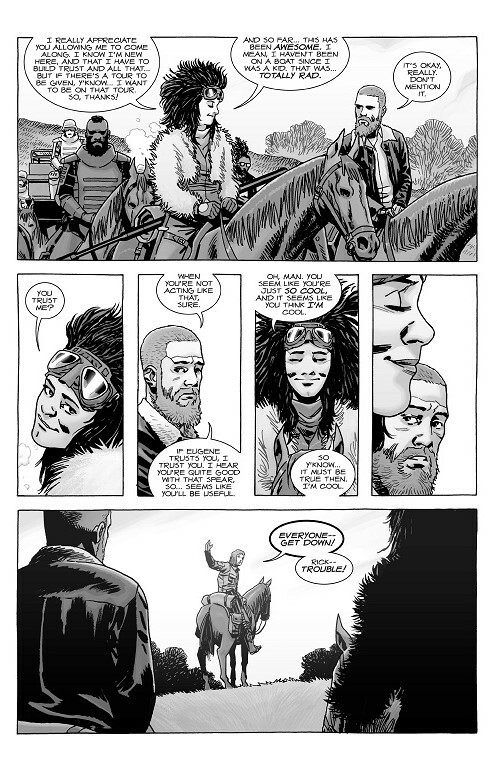 At the Hilltop, we catch up with that family that was with the Whisperers. 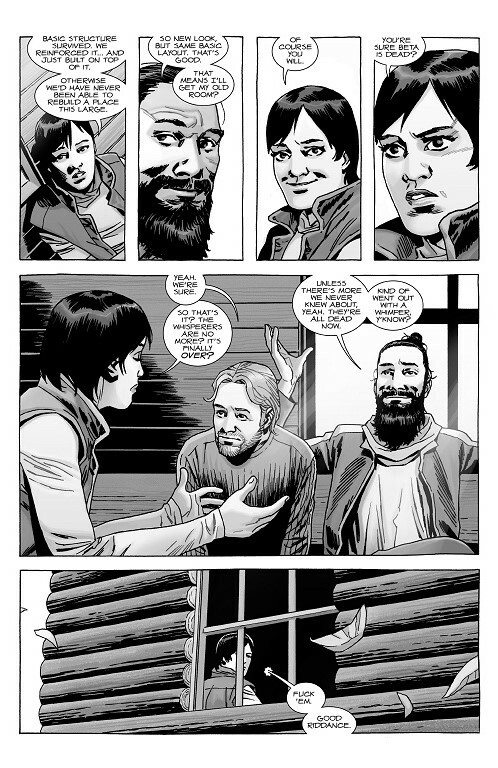 Carl makes friends with the son, Joshua, who explains that he and his parents do indeed want to stay. Given that they probably weren’t with the Whisperers very long, they might not have had a chance to get indoctrinated into their way of life, unlike Lydia. So chances are they’ll soon become active members of the community. 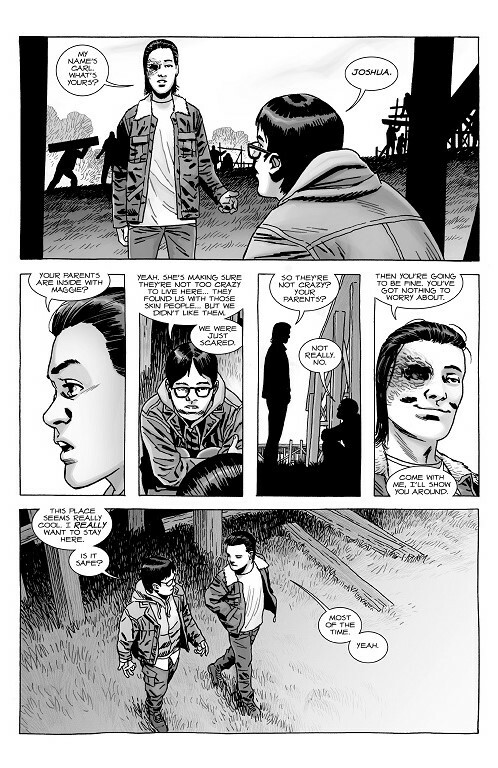 That seems to be how Aaron, Jesus, and Maggie see it, as the two update Maggie on finding the family out with the Whisperers in the woods. As of now, they don’t seem to be a risk, but as is always the case with newcomers, they’ll be watched. You can’t be too careful with strangers in this world or take any chances. Also, we learn that Rick wants Carl to visit home sometimes and I find myself remembering that yeah, Carl isn’t just taking some extended vacation to the Hilltop. He’s staying there for the foreseeable future. Rick may not be far from him, but they’re still no longer living in the same community, so it’s nice that Rick wants his son to come and see him every now and then. What parent doesn’t want that from their kid? 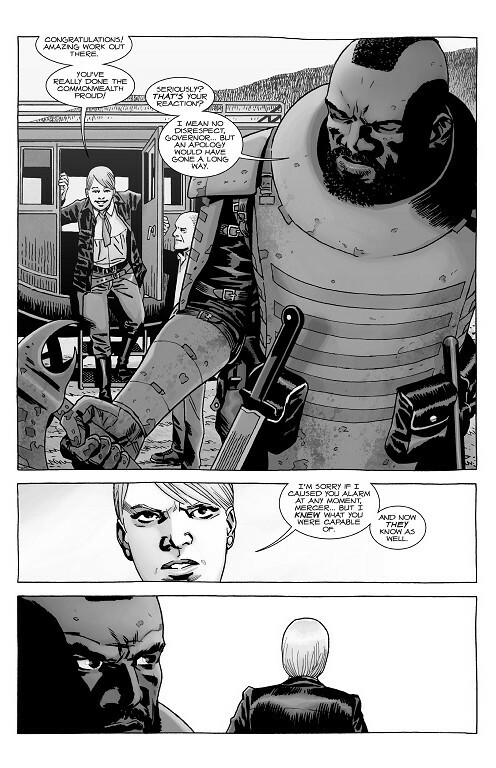 But back to the plot, you’ve got Aaron, Maggie, and Jesus agreeing that the Whisperers just went out with a whimper in light of Beta’s death. So good riddance, right? If so…I won’t say it’s underwhelming, but I can’t help but shake the feeling that there are some Whisperers still out there. I may be wrong, but we will see if we ever see more of the Whisperers. Let’s return to Alexandria. Princess brings a bit of levity to every scene she’s in, and this is no exception, as her being super enthused to be in Alexandria is very apparent. She’s always got this giddy grin on her face and I love the look of uncertainty on Rick’s face whenever Princess talks. 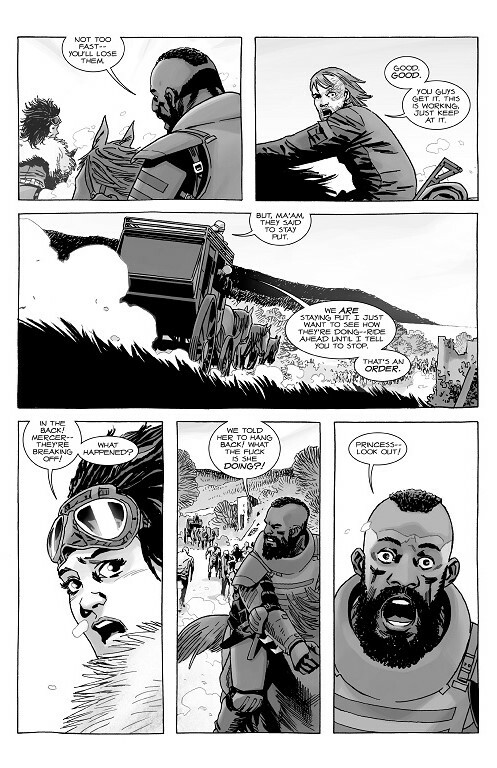 Hell, Rick might agree with Magna that Princess needs to live at the Hilltop. If just to get her off of his back. Then we get our action set piece of the issue with a sizable group of roamers. Not a massive heard that’s large enough to be an issue, but not small enough where it can just be ignored because it could soon reach Oceanside. So everyone decides to lend a hand in making sure the roamers don’t reach that community, and this includes Mercer joining in to help. Even though Mercer’s obligations are to Pamela, he does decide to help, but does have a freak out moment when Pamela decides that she wants to get a closer look. 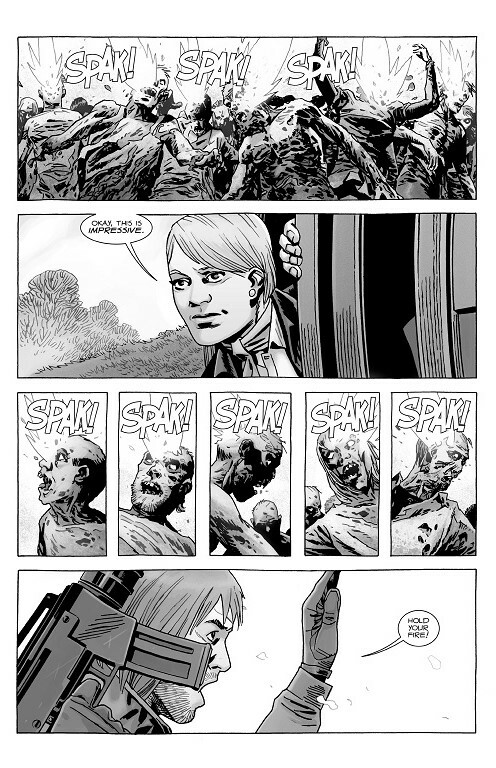 Not a bad idea when she’s still trying to get a feel of how Rick operates, but it does put her in the line of fire and no doubt causes her soldiers to worry for her safety, even if she doesn’t appear to be in any immediate danger. In essence, she’s putting a target on her back when she doesn’t have to do that. Sure, it’s nice to see how other communities deal with roamers, but this just creates more stress for your soldiers. But things get a bit more hectic than normal when Princess is thrown from her horse. Luckily, Mercer manages to save her, but more than that, we’re seeing more of the advantages of the Commonwealth soldiers wearing armor. When you’re out in the open and exposed, you’re fresh meat if roamers surround you. For these soldiers, though, that’s nothing. The cavalry finally arrives and, under Dwight’s command, dispatches of the roamers with one bullet each. Very efficient and this doesn’t go unnoticed by Pamela, as she does find it impressive. Now where did the army come from? Well, turns out that Dwight had them follow him, and this seems to irritate Rick, as he says that Anne and Vincent were supposed to be on lookout duty. In effect, this whole incident could have been avoided if they were on watch and could’ve either steered the roamers away themselves or could have had time to gather others, eliminating the need for this little incident. Well, just when it looked like Rick and Dwight had squashed their beef, Dwight does something that pisses off Rick. 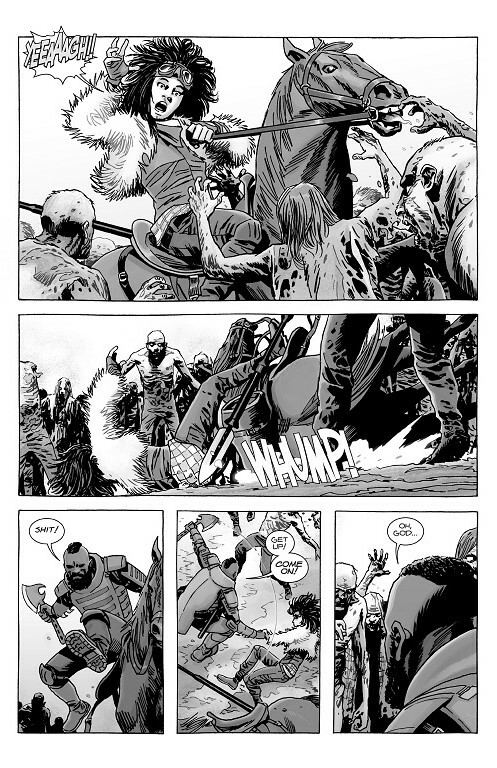 And given how seriously Rick takes guard and watch duty, he won’t just overlook this. And Princess kisses Mercer. Isn’t that lovely? This girl just doesn’t know the definition of ‘timing.’ And if I had to guess, there’s a sizable age gap between the two. Though like Rick, I love the dumbfounded look on Mercer’s face in response to Princess. But sticking with Mercer, his focus is on Pamela and how she put herself at risk, but she’s got such a nonchalant response to her actions. In her mind, she already knew what Mercer was capable of and figured he could handle himself. But now the others are aware of his abilities, too. That’s not an excuse for what she did, nor is it the best of a justification since she still put herself in danger. So I’m left wondering if this just adds to Mercer’s anger towards the Commonwealth and if he’ll do more than just blow off some steam. This issue was fine. Nothing bad, but nothing that makes it stand out. I think it’s one that reads better when there’s a full volume out and you can go from issue to issue. Things do happen and I like that we got some development over at the Hilltop. And now that Pamela knows what Rick and company are capable of, what will she do with that knowledge? Hoping we find out next time. 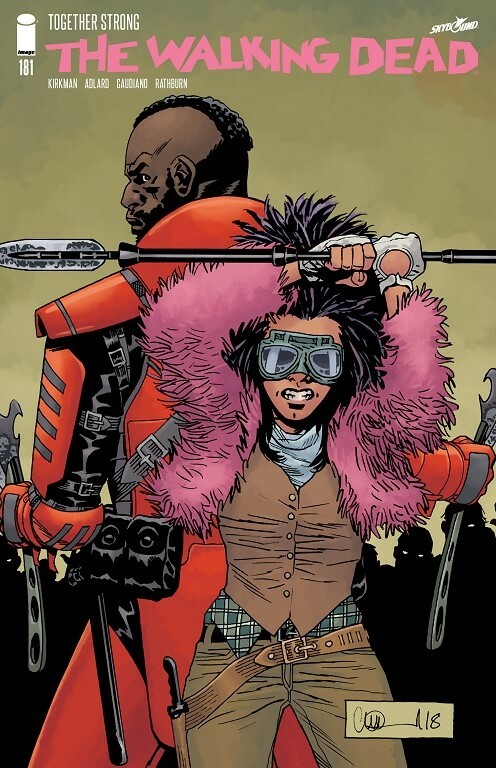 This entry was posted in The Walking Dead and tagged Aaron, Alexandria Safe Zone, Carl Grimes, Charlie Adlard, Dwight, Elodie, Heath, Jesus, Laura, Maggie Rhee, Michonne, Pamela Milton, Princess, Rick Grimes, Robert Kirkman, Whisperers by omarid513. Bookmark the permalink.